HÀ NỘI — Poor and marginalised communities in Việt Nam and other countries in the Asia-Pacific region lack access to good quality health services, especially in sexual and reproductive health. While rapid growth in the region has lifted millions from poverty, the benefits and costs of development are not equitably shared among countries and population groups, according to experts at the 9th Asia Pacific Conference on Reproductive and Sexual Health and Rights. The event was hosted by the Việt Nam Public Health Association yesterday in Hạ Long City in northeastern Quảng Ninh Province. The three-day event, which will conclude on November 30, attracted around 1,000 delegates from over 40 countries. It will seek to advance the implementation of the Programme of Action of the 1994 International Conference on Population and Development and contribute to achieving the 2030 Agenda for Sustainable Development, underpinned by the Sustainable Development Goals. Five main topics of sexual and reproductive health are being discussed during the conference. The topics include overcoming social, cultural and religious barriers in sexual and reproductive health, achieving a just economic order for sexual and reproductive health, strengthening justice systems for sexual and reproductive health and rights, making good quality sexual and reproductive health education available to all and advancing justice and equity in sexual and reproductive health. At the event, Deputy Minister Nguyễn Viết Tiến said the sexual and reproductive health sector had improved in recent years. The rate of people using contraceptives reached 80 per cent in 2015 and the rate of maternal mortality has fallen to 60/100,000. Despite progress, there is still a disparity in sexual and reproductive health between vulnerable groups and the rest of the population. Lê Vũ Anh, president of the Việt Nam Public Health Association, said the conference provided a platform for participants to share their experiences and lessons learned. It will also offer opportunities for individuals and networks to strengthen regional co-operation to advance sexual and reproductive health and rights for all. The Asia Pacific Conference on Reproductive and Sexual Health and Rights is a biennial gathering of civil society organisations, young people, academics, government officials, media and private sector firms concerned with sexual and reproductive health and rights. This is the first time Việt Nam hosted the conference. 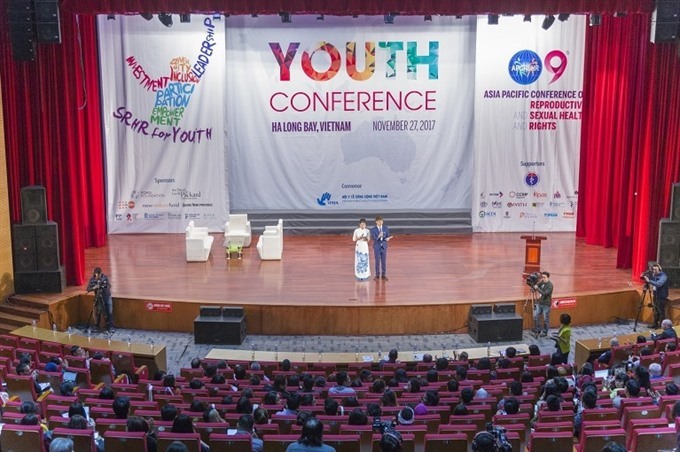 On the sidelines of the event, the Youth Conference was held on Monday to gather young people from across the world who are working in the field of sexual and reproductive health and rights. Bjorn Andersson, Asia Pacific Regional Director of the United Nations Population Fund, said that statistics showed that in the 21st century, despite many advances in health and science, approximately 10,000 adolescent girls die every year from pregnancy complications in the region. About 5.2 million adolescent pregnancies occur every year. In several countries adolescent pregnancies are actually increasing despite the global trend of a decline.